JOEY DUNLOP Dunlop is remembered as one of the greatest road racers ever, his 26 wins at the TT marking him out as the most successful rider in the history of the event. But while they are mightily impressive, the statistics tell you nothing about the man himself. In racing terms he had speed, unsurpassed circuit knowledge, mechanical sympathy, physical toughness and bravery. Plus an incredible love of the sport. Away from the track, though, he was a family man, a compassionate human being. Joey never had much to say, but his sheer presence had a lasting effect on family and friends. By any standard of achievement, he was a superstar. Yet, as an individual, he combined the airs and graces of a postman with the preening self-regard of a monk.
" I’m just like any of the bikers who come to the Island to watch the racing " , he explained a few years ago. " I just can’t resist going out for another lap. I love the TT like I love motorbikes and road racing. " The finishing line, not the bottom line, was what motivated him. Famously, Joey remained loyal to Honda for the final two decades of his racing career, yet for more than half of those years he had no contract. His word was as good as his bond, and he expected the same from those he dealt with. If this was naïve, rarely was he ever exploited. If Joey’s loyalty to Honda was legendary, he was noted, too, for never forgetting a friend, or a favour. " I still like to get involved with the people who helped me when I had nothing, " he once said. And there can be very few Irish racers of recent years who Joey hasn’t loaned essential parts anything from a gasket to an engine. Of course, it wasn’t wise to push it too far. Joey was " a bit taken by surprise " to be promoted from MBE to OBE in February 1996. Some years later he was asked what the letters stood for. " Owen Borrows Everything, " he replied with a grin, of his friend and protégé, the late Owen McNally. Brother Robert has his own perspective on Joey’s late career. " Joey was fortunate that he had a God-given talent, something he didn’t have to work hard at. Fellow racers like Roger Marshall used to train really hard and couldn’t understand how Joey could go pubbing, arrive 10 minutes before the start, throw his leathers on and win. But later he realised that as you get older, even he had to try harder. " Ian Switzer, Embassy Irish 500cc champion back in 1983, has an abiding mental picture of Joey at Yugoslavia’s Rijeka circuit in 1979. " We’d just arrived and there he was set up with his old 408 Mercedes, with a tent lashed to it and held down by old starter motors. He was living on toast and tins of baby potatoes, because he could recognise the picture on the can.
" He’d work all night, get a wake-up call about 15 minutes before practice, tape these bits of plastic oil can to his knees and off he’d go. The rest of the paddock was pretty flash and professional, but Joey was just doing it his way. " " His way " was what made Joey special. Like the first time he was confronted by a factory tyre technician way back at Dundrod in 1980. " Och, put a slick on the back and a wee bit of hold (tread) at the front. " This was the same man who used to stay with his family at 35 Groudle Glen Cottages on the Isle of Man. Often, of an evening, the living legend and folk hero would stroll down to the Manx Arms for " a swallow " and a game of darts with the locals. Almost as accomplished with the arrows as with a racing bike, he once hit three 180s in an evening. He was just one of the lads. " He had no airs or graces in the early days, " says his wife Linda, " and he never got any. We’d go out for a meal and he’d be recognised, and he really couldn’t understand why. He was the most down-to-earth person I’ve ever met. " Though the romantic notion now is that the special affection for Joey sprang from such ways, it was his riding which first endeared him to the Irish public. Nick Jeffries remembers " this scruffy lad with amazing talent " at the Skerries races in 1975.
" Everyone was warning us about this man Joey and how we’d have to go some to beat him. The other thing I remember was an invitation to join race officials in the stewards’ tent for a wee drink before the last race. Irish racing was like that then.
" You see all this stuff about his compassion, about Bosnia and so on, but the bottom line was his riding ability, " reckons Paul Farmer, cousin of the late Mark, a racer who lost his life at the TT. " You were in awe of the man. During the ‘80s in Northern Ireland, the Troubles were bad, but for two days each year the North-West and the Ulster he was the one Irishman who was a match for the English and foreign riders. And everyone would turn up to see this one man. I don’t think a lot of his fans knew or cared what religion he was. My brother wasn’t interested in motorcycle racing, but he’d go to watch Joey, and my mum was the same. Even my gran used to listen for him on the radio. Anyone else was just a rider. Joey was an institution. " " It didn’t matter who or what you were to Joey, " recalls Irish race promoter Billy Nutt about a race meeting near Riga. " The Latvian minister for sport wanted to meet him, but he’d already arranged to go out for a bite with some of the lads, so that’s what he did. " There was no rudeness or lack of respect. Had the minister got in first, he’d have been the one sharing the dinner, but rank bough him no special privileges. " In motorcycle racing, the top wages and the biggest egos can be found in GP paddocks. Joey had little use for either. In his 48 years, he only ever bought one new car. And even though he could probably have had a new one every few months from Honda, he never even asked, preferring a van or his elderly Mini. " Last year he went to the North-West 200 in this battered old red Mini, " grins Linda. " He learned me one valuable lesson never worry about what people say, just get on with it. " No public figure was ever so lacking in spin.
" I don’t think Joey ever wanted to be a GP rider, to be in the shop window, " reckons former Honda racer Roger Burnett. " He might have cut it as a rider, but all the media stuff that was miles scarier to him than Bray Hill flat-out. The rest of us did the whole image bit because we wanted to earn more money. On one level we felt Joey could destroy the whole thing with one picture or interview. But the truth was that he was more popular than the lot of us put together. And he hated being confronted by the public, though he loved kids. He’d sign autographs for them all day. " " You couldn’t run Joey, " explains long-time manager and friend Davey Wood. " You had to go with him. You could try to steer him gently in some directions, but that’s all. He had his own way of doing things. Trying to get him to do the corporate thing at the TT wasn’t easy. He’s say, ‘look, do you want me to get these bikes going, or do you want me to shake hands and meet people? " In a racing career even longer than Joey’s Mick Chatterton came to know him well. " He could give the wrong impression that he couldn’t be bothered. But it wasn’t that at all. He was shy, yes, and his mind was sometimes just elsewhere. When you got his confidence he was a fantastic bloke. " For an Englishman, in particular, getting Joey’s confidence wasn’t the easiest of tasks. Chatterton himself one of the most easy-going of racers reckoned he truly broke the ice only in 1998. He said: " " e needed help to unload the van after losing his finger at Tandragee. Then last year we were walking back to the paddock after a plug chop, and he asked me how the wee bike was going. When I told him not so well, he told me to drop by the garage. When I got there, he beckoned me over to his corner and started pulling boxes from under benches a cylinder and head, exhaust, piston. ‘Put those on’ he said. the Honda brass just looked on in amazement. The last time I saw him was when I took the parts back after the race.
" But it wasn’t just his riding. The man himself was special, though it’s hard to define that, too. He didn’t talk much and didn’t appear to have much of a personality but he'd got the biggest personality I’d ever seen.
" I knew Mike Hailwood pretty well and this might sound stupid because their backgrounds couldn’t have been more different, but they were very similar. Neither could stand the bullsh*t, neither knew what a lot of the fuss was about, but both could walk into a place and lift the atmosphere just by being there. And both would always accept being beaten by a better guy on the day. " Mechanics, too, warmed to Joey. 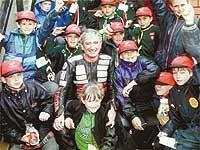 You can talk to any of Yer Maun’s many helpers, most of them volunteers, and hardly any can remember him ever saying ‘thanks’. That isn’t to say he was ungrateful, just that he communicated it in different ways to the rest of us. And, most of all, there was something about him somewhere between an aura and an almost child-like vulnerability that provoked people to help. Even Linda encountered the same: " He didn’t let on, but he noticed. Three years ago Joey and the girls arranged a secret holiday for me and him to the Seychelles after our 25th anniversary. He must have heard me cooing over the place when it was on some holiday show on TV. That was typical Joey. " " He was one of the nicest people I’ve ever worked for, " reckons Carl Fogarty’s former WSB mechanic Slick Bass, who spannered for Dunlop’s Rothamans Honda team. " He wasn’t major chatty, but he was very thankful for what you did for him. Even though we were being paid for doing it, he didn’t seem to expect it. He seemed to prefer to feel as though we were working for him because we were mates. " Bertie Payne, Joey’s 250 sponsor for several years, witnessed the phenomenon year after year. " It didn’t matter where you went, people just flocked around. He was everybody’s hero. He’d never complain, unless someone came to him in the last seconds before a race, then he might snap a wee bit. " " I’ve seen him angry, " admits Bob McMillan of Honda Britain. " You knew when he was because you just kept out of his way. He wouldn’t kick things around, just go very quiet and intense. People would part before him as he walked through the paddock. Mind you, he was that revered they’d usually do that even if he wasn’t in a huff.
" And he would very rarely turn up on schedule. You had to go and get him. For the Honda day at Laxey I would turn up at his cottage in Groudle Glen at 2pm in the afternoon. He was usually still in bed after a celebratory session. I’d sit on the bike outside, waiting while he chased his trainers around the bedroom. But when you finally got him there, it was worth it. Just by being there he made everyone’s day. " In other circumstances the 2000 TT might have been remembered for a typical Joey piece of comedy in the opening practice session. Having completed a lap on his 125, he jumped on to the 250 thinking it was fuelled and ready to go, disappearing down the Glencrutchery Road before his crew could put him right. At the Verandah the bike coughed and died. Joey coasted to the Bungalow, still high on Snaefell Mountain. Undaunted, the Irish legend somehow contrived a length of plastic hose and borrowed fuel from a marshal’s FireBlade.
" Won’t you need oil in that? " queried an amused onlooker. Without further ado, Joey unscrewed the fork drain plugs of his 250 and added it to his booty.
" That story got back to the pits before him, " said Irish bike dealer Ernie Coates shaking his head. Then there were the illegal sorties on to the public roads, with which any red-blooded road rider can identify. " Before the North-West in 2000 the Vimto Hondas turned up and needed testing, " remembers Sammy graham, Joey’s mechanic and close friend.
" I reckoned the Finvoy road would be perfect. Joey sends me up in a car to check it’s clear and who should I meet at the end but the police? So back I go to tell Joey. He’s gone. ‘He left after you on the bike they tell me’, they tell me. Two seconds later my phone rings. ‘Did you meet the police?’ asks Joey.
" Did you? Where are you? " I ask him. ‘I’m hiding at your place.’ Then the police arrived. ‘When Joey turns up,’ they said,’tell him we passed him going the other way at about 150mph, but he was a bit too quick to give a ticket. And wish him all the best for the races. " To discover more about Joey’s life away from racing, read " Joey Dunlop, His Authorised Biography " , from which this feature was adapted.